1. Desired coolant temperature. This is the coolant temperature at the inlet of your process or equipment. It is important to measure the temperature at this point to allow for coolant heating as it travels from the chiller to the process. The longer the distance to be covered, the higher the potential heat gain. This heat gain can be minimized by insulating the cooling line and positioning the chiller as closely as practical to the equipment or process being cooled. It is generally recommended that 20 to 50% be added to the calculated heat load to provide a safety factor if the chiller will be operated at ambient temperatures above 68°F (20°C) or at high altitude, or if the heat output of the device is variable. This will also provide a margin of safety for future cooling needs. That said, resist the temptation to build more of a safety margin into your chiller than is necessary; an oversized chiller will not cool your equipment any more effectively but will cost more to purchase and operate. 3. Coolant flow and pressure. These parameters are normally provided by the equipment manufacturer and are a function of the surface area and the heat transfer characteristics of the process/material being cooled. It is crucial that your chiller deliver coolant at the proper flow rate and pressure — if the flow rate or pressure is too high, the equipment being cooled may be damaged; if it is too low, the heat removal will be inadequate. Your chiller supplier can help you specify the type and size of coolant pump most suitable for your needs. 4. Condenser heat dissipation. The final factor influencing chiller/heat exchanger selection is how the heat removed will be dissipated. Devices with air-cooled condensers exhaust heat into the surrounding air and require only power and ventilation for operation. Devices with water-cooled condensers transfer heat to the facility’s cooling water supply. 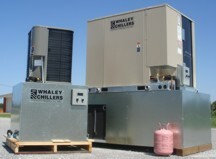 Chillers with remote condensers (i.e., the condenser is located outside the facility) are also available. These are quieter, require less space, and do not add heat to the building interior, thus reducing summer cooling costs. However, they are more expensive to install and are not easily relocated. Naturally, there are other factors — such as heating capability, remote temperature tracking, DI water capability, etc. — that affect how a chiller is ultimately configured. Conscientious chiller vendors will take all these into consideration when helping you select the best chiller for your particular application.